When we bought our boat back in January one of my main jobs was to write a list of things we need to buy. It's important for us that the boat is a "home away from home" and that we make it as warm and cosy as possible. We'll be doing a lot of cooking on the boat so cookware and tableware were high on our list. We obviously couldn't have anything breakable and we were keen to stay away from anything too cheap, like our previous camping set which was £1 from a local shop. 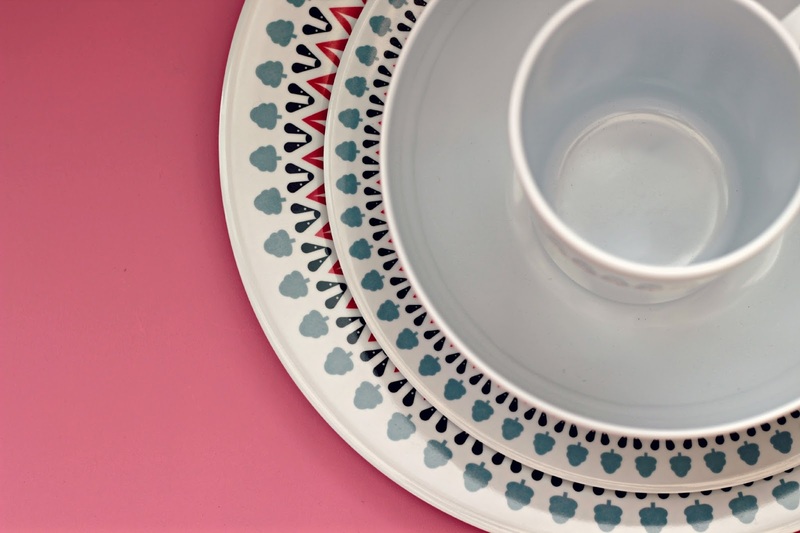 We felt that something a little nicer to eat our dinner on would make us enjoy dinnertime more, after all, we wouldn't eat from a super cheap plastic dinner set at home. 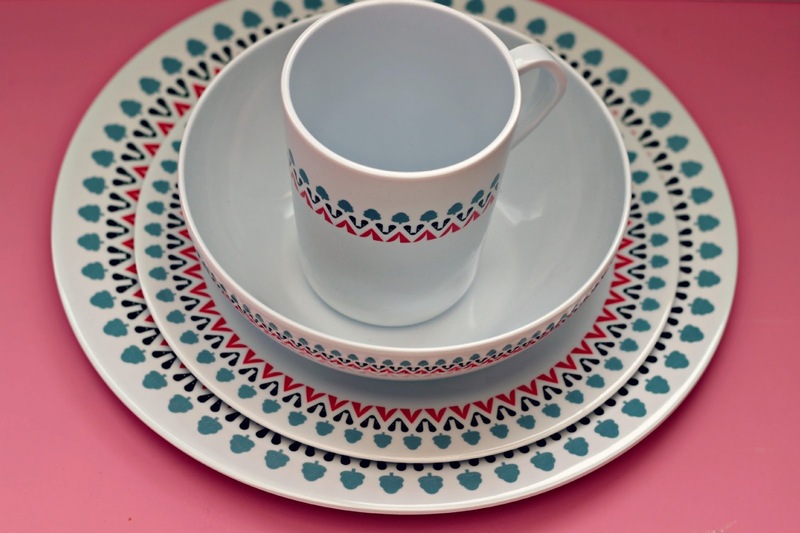 The 16 Piece Witley Melamine Set from Olpro Shop suited this perfectly. 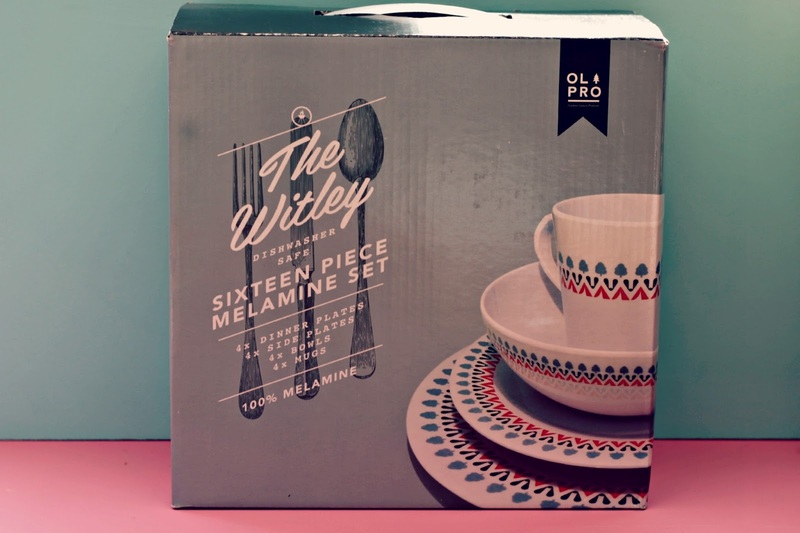 The set comes with 4 dinner plates, 4 side plates, 4 bowls and 4 mugs. The design really attracted me as the border around each of the pieces is really bold and pretty without being to overpowering. 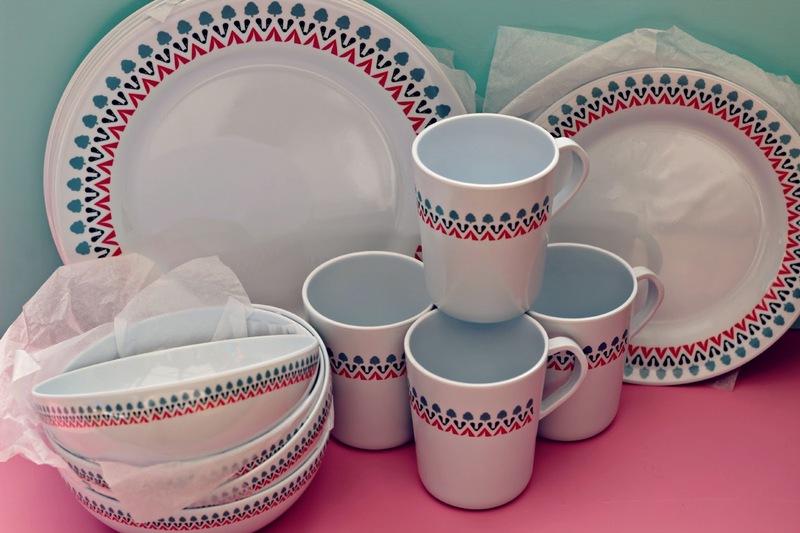 I liked that the set doesn't look or feel cheap, it looks like the kind of set you would find in any household kitchen so really creates that home from home feel we are wanting to achieve. 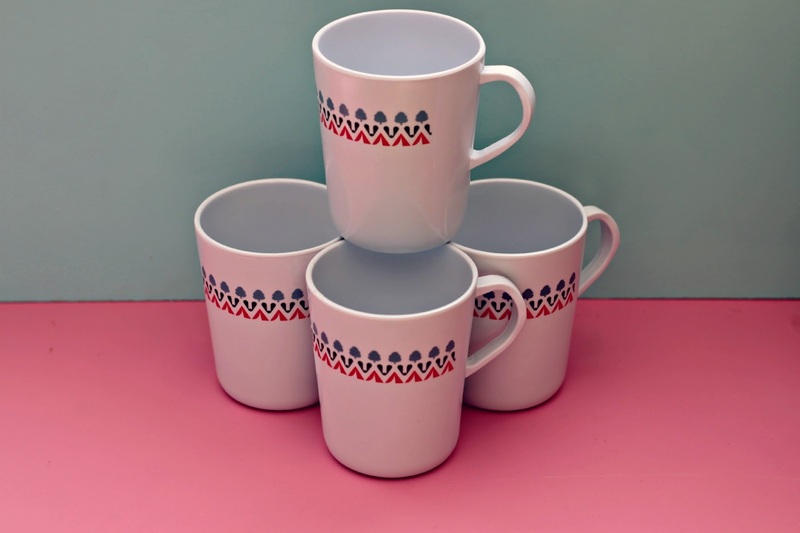 We have found in the past, when we have camped, that any sets we have found have been quite small, particularly mugs and bowls but these are great sizes. Again, the size you would find in any kitchen at home. Obviously with us having a sailing yacht we won't be still and steady for the majority of the time so we needed something that was strong and wouldn't get damaged as it is in storage and these feel really robust and I'm sure will last us a long long time. The set costs £29.99 which is really reasonable considering the quality, design and amount of use it will get. Glamping has really taken off and is especially appealing to families looking for a cost-effective holiday option. The leisure industry has been slow to respond with most offering a mish-mash of camping equipment in a host of different styles and colours. Worcestershire-based OLPRO spotted a gap in the market and has developed a coordinated glamping range for families who want stylish products coupled with a high technical spec. Included within the range are different-sized tents that sleep 3, 6 or 8 people respectively. Easy-to-erect, the tents are loaded with features generally found in top-of-the-line tents. This year they are introducing their newly designed OLPRO Cocoon Tent - in two different sizes . . . plus a fab, pop-up Beach Hut in 3 different colours. OLPRO have created mix-and-match melamine table wear, sleeping bags in two funky designs to co-ordinate with their tents and windbreaks. Commenting on their groundbreaking approach, OLPRO MD, Danial Walton, said, "As well as offering tents which co-ordinate with the rest of the range, the striking colours we've chosen stand out from the crowd. Our colour-way reflects the technical nature of our tents which are simple to erect, offer a host of features and can be used over-and-over by a family." I was sent this dinner-set for the purpose of this review.